Boating etiquette will vary slightly depending upon what type of boat you’re travelling on and on what kind of stretch of water. 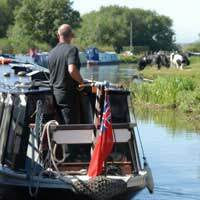 However, whether you’re taking a gentle leisurely cruise along a canal in a narrowboat or sailing the ocean waves at high speed in a luxury yacht, it’s important that you take some time to understand the courtesies involved when you are making certain manoeuvres or encountering other craft along the way. Here are some general rules of etiquette that are fairly common to all different types of sailing although you should still always do a bit of research or buy a book about the specific type of boating you’ll be doing in order that you do not become considered a nuisance or annoyance to others out on the water. The usual rule of thumb is that if you’re intending to pass another boat, you would normally do so from the right hand (starboard) side. When overtaking, do so slowly and if the other vessel is travelling at a slower speed than your craft, slow right down and keep as wide a berth as is safely possible as you pass to avoid any wake from the water rocking the other craft. People will not be best pleased if you pass them at speed which causes their boat to rock violently, especially if they’ve just sat down to a meal they’ve prepared which then ends up going all over the place. Likewise, if it’s your boat that’s being overtaken, you should slow your speed right down to allow the passing boat to overtake you more easily. Yet again, when you’re approaching a mooring point, do so slowly to avoid creating a wake and don’t get too close to any of the other boats, especially if there’s a strong wind blowing as it doesn’t take too much wind to cause a collision. Try to choose a mooring spot which is suitable. For example, if you like playing music on your boat, it would be improper to moor up right next to another boat which may have a family onboard with young children who may need to go to bed early. The best rule here is if you’re intending to play music and/or going to have a barbecue, try to be as far downwind as you can to avoid disturbing others too much. Whilst you may want to enjoy yourself, it’s important you don’t do so at the expense of others’ relaxation and enjoyment too. Running a generator of an evening isn’t a good idea either and also remember to either clear away or take any rubbish you have with you when you leave. In reality, boating etiquette when it comes to mooring is simply about common courtesy and respect for others, much as it would be in a similar fashion if you were pitching up at a campsite. At a marina, get in, fill up and get out is the best rule to follow. Once you’ve refuelled, sail away from the refuelling area as other craft may be waiting to refuel too. In other words, don’t simply see a refuelling stop as an opportunity to leave your boat there for a longer period whilst you go off to go shopping to pick up supplies, for example. You can always do that later away from the fuelling station. Some marinas, moorings and harbouring points may not have a dockmaster to assist all the time so the sailing ‘fraternity’ will always try to help each other out with docking and undocking so be amenable to assisting as you may need other boaters to help you out too at some point. If you’re inviting guests to visit you whilst you’re moored up at a particular place, make them aware too of what is expected in terms of courtesy towards others and familiarise them with any emergency procedures and other rules that you would like them to adhere to. Remember, even though you might have a solid reputation amongst other boat owners, inconsiderate guests can ruin that in an instant so it’s always better to make everyone aware of what’s expected of them so that you can all enjoy your experience together without ruining things for other people.